In her 42nd novel and her fourth Walker family book, J. 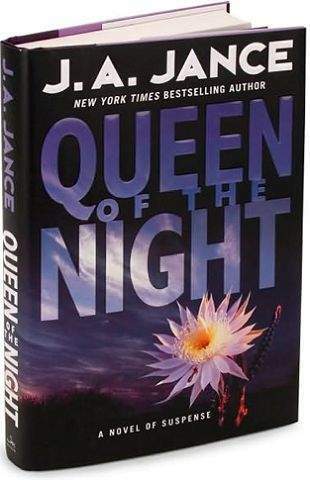 A. Jance dedicates Queen of the Night to the late Tony Hillerman. Hillerman wrote extensively about the Navajo and blazed the path of Native American mystery literature. Jance continues the journey by featuring the lesser-known Tohono Oodham Nation that is located west of Tucson, Ariz. This tale opens with the murder of Sully, a young college student from Arizona whose body was found on the beach in San Diego during spring break in 1959. Moving forward to 2009, an angry soon-to-be ex-husband snaps and goes on a murderous binge spanning two states and multiple victims. Law enforcement from multiple agencies attempt to track and stop the rampage. One such officer is Dan Pardee, half Anglo and half Apache, who is a member of the Shadow Wolves, an agency working on the Tohono Oodham Nation for Homeland Security. While on patrol, Pardee and his fellow Iraq veteran dog, Bozo, happen upon multiple murder victims and discover the lone survivor and witness, Angie, a 4-year-old girl. Apparently, two of the victims were having a private celebration when it was interrupted by deadly gunfire. The Queen of the Night in the title refers to the unique night-blooming cereus that flower only once a year. The beautiful white, fragrant flowers last only a matter of hours. The Tohono Chul, the real botanical garden in Tucson, hosts a bloom watch, and Jance has incorporated this event into her novel of suspense. The Tohono Oodham legend honors the brave grandmother, Old White-haired Woman, who traveled many miles to bring back to the tribe her daughters son called Brought Back Child so he can be raised among his peaceful people. Her sacrifice is rewarded each year when the plant blooms. Jance introduced the Walkers in 1991s Hour of the Hunter, which was based on a real-life experience in which Jance was a serial killers intended victim. In the book, the character is Diana Ladd Walker, a writer. Diana is married to former homicide detective Brandon Walker. They have a son and an adopted daughter, Dr. Lani Walker, who is Tohono Oodham. Jance tells the story with several points of view and a large cast of characters, which can cause some confusion to readers who havent read the previous books in the series. There also is a question of just whose story is this? Is it Brandons, as he attempts to solve the 50-year-old unsolved murder of Sully for his dying detective friend and find out who got away with murder? Is it Dianas, whose work is suffering because of memory problems and who is experiencing hallucinations? Or is it about Dr. Lani Walker, who is walking the line between two cultures? Then there is Brian Fellows, a Pima County, Ariz., homicide investigator who has a close relationship with Brandon Walker and is following leads to catch the new killer. Almost every character featured in the story has endured a bad childhood, suffered trauma as a child or came from a broken home. How these experiences affect them as adults ranges from showing extreme empathy for others to illogical rage toward others for perceived wrongs with disastrous consequences. Jance has woven together a complex and suspenseful story with appealing characters, but some questions remain unanswered by the end of the novel leaving readers wanting more. Queen of the Night will appeal to Jances fans who like to mine their books for suspense and look forward to more intrigue. Leslie Doran is a freelance writer whose book reviews appear regularly in TheDenver Post, numerous magazines and other publications. Reach her at sierrapoco@ yahoo.com.